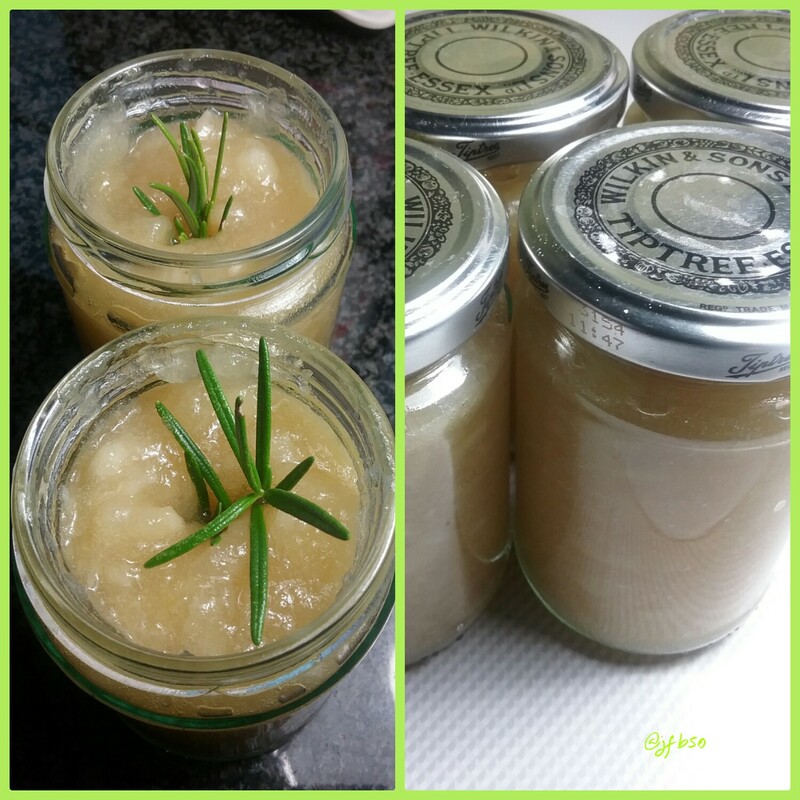 What to do with some much produce…apple, honey and rosemary jam | Jo's food bites. I first tasted this delicious combination at a friend’s house a couple of years ago. Whenever they visited some friends in France they would come back with a jar of loveliness called: Confiture de pommes au romarin et au miel de montagne. I acquired a recipe and then promptly forgot about it until recently. Recipe translated and tweaked resulted in 5 jars of apple, honey and rosemary jam in my kitchen yesterday. I resisted the urge to taste it until today to allow the rosemary to infuse the jam…delicious. Put the sugar, water, lemon juice and honey in a large pan and bring to the boil – stirring frequently. Put the apple pieces in to the syrup mixture along with the apple and lemon pips wrapped in a piece of gauze. Bring back to the boil and simmer gently for about 15 minutes or until the apples are soft. Remove from heat and mash about half of the apple mixture down – I used a potato masher. Put back on the heat and simmer for anohter 5 – 10 mins. Put in to prepared jam jars and push a sprig of rosemary in to the mixture ahead of sealing the jar. I have no idea how long this will store – probably quite irrelevant as one jar has nearly gone already. I didn’t treat this like an ordinary jam, cheese or jelly in that a setting point wasn’t reached. The consistency is of a very, very thick sauce. Delicious on toast but I would imagine equally scrumptious with pork or game. « What to do with so much produce? This looks so yummy, will definitely try making it!